Damon & Naomi have covered "The World's Strongest Man" for a forthcoming Scott Walker tribute album. 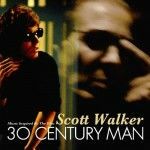 The album with the snappy title "Music inspired by the film Scott Walker 30 Century Man" will be released by Lakeshore Records in May and also includes contrinbutions from Laurie Anderson, Ulrich Schnauss and St Etienne amongst others. The album is being curated by Stephen Kijak the documentary maker responsible for the Scott Walker film. The album is listed on Amazon.com but is currently priced at $18.50 so you might want to site tight until it reaches a sensible price before ordering. The soundtrack, which Lakeshore will release digitally on April 21 (with physical copies arriving April 28), works as a tribute album, with artists like Saint Etienne, Ulrich Schnauss, Laurie Anderson, and Damon & Naomi covering Walker's songs. In other Damon & Naomi news they have just returned from a short Italian tour and are now at "home working on a series of reissues."